Get your share of €50,000 in instantly awarded cash! Connect four winning King hands in a line on the Konnect Kings board and win an instant cash prize! Complete any horizontal or vertical line to win prizes of €10 free cash- no strings attached. Be quick and start playing now! Follow up your progress on the Konnect Kings board and the remaining prize fund from your Poker Client > My Account page. The promotion runs from November 13th 2017 at 00:00 GMT until 26th of November at 23:59 GMT or until the €50,000 prize fund has been spent, whichever comes first. The promotion is limited to Hold Em cash games of stakes €0.10/€0.20 and higher. 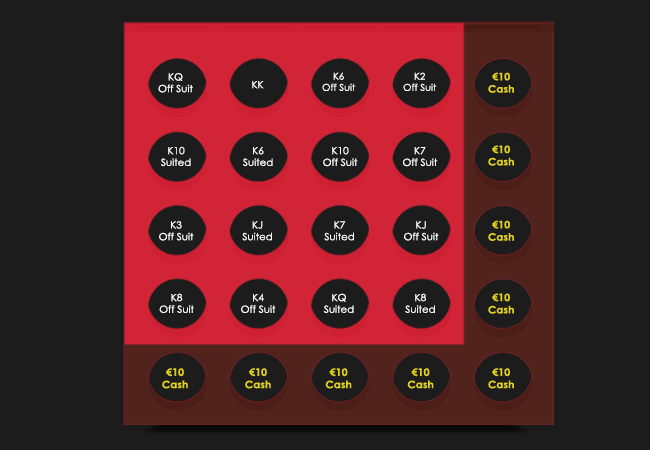 €10 cash will be instantly credited to each player as they complete a horizontal or vertical line. Diagonal lines on the board do not award a prize. The maximum an individual player can win from the promotion is €80. You may not create and have more than one account at Redkings. If you do, you will forfeit all prizes and you risk closure of all your accounts.